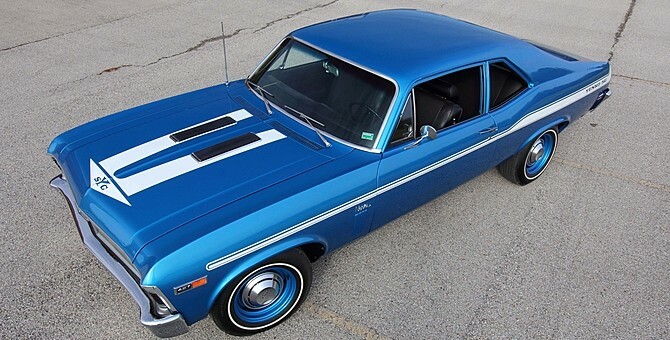 When it comes to Yenko Chevrolets, the Camaros and Chevelles get most of the glory both due to the number that were produced and because in 1969 they were factory-built with 427s. The 1969 Yenko Nova, on the other hand, wasn’t afforded the luxury of being factory-built with the 427, but it likely is the fastest Yenko of all. One of these rare Chevys will be headed to Mecum’s Kissimmee auction in mid-January 2015. Since the factory didn’t build these Novas with 427s, Yenko had to make the conversation itself. Starting with a Nova SS 396, Yenko merely swapped the motors (a simple task) and made sure the rest of the vehicle was up to the task of handling 450 horsepower from the L72 427. Yenko’s records show that 38 Novas received the Yenko Super Car treatment, although several cars were left unconverted as 396 cars. This 4-speed example that’s headed to Kissimmee was given a frame-off restoration around 15 years ago. Sporting LeMans Blue adorned with Yenko/SC graphics, this Yenko Nova is also complemented with poverty caps, black bench-seat interior, AM radio, and not much else. If you just got paid and have a back pocket burning with green, you just may be the right person for this Nova.